A man who served his musical apprenticeship in the creative environment of Ireland will be guest conductor for the Darwin Symphony Orchestra’s (DSO) 15 September concert in Darwin. 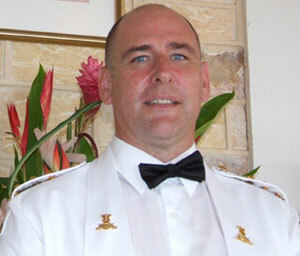 Captain Liam Daly, now Officer Commanding/Music Director of the Australian Army Band in Darwin, has a long history studying, playing and directing music in his native Ireland. Having studied the French horn under Victor Malirish at the Royal Irish Academy of Music in Dublin, Capt Daly went on to become a member of the National Youth Orchestra of Ireland, the Irish Youth Wind Ensemble and the National Youth Choir. Capt Daly will conduct the DSO’s 15 September concert entitled Classical DSO for the music lover at the Darwin Entertainment Centre. The performance will include William Wallace’s Maritana Overture, and Michael Haydn’s Double Horn Concerto in E flat, performed by two internationally renowned horn players, Robert Johnson, Principal Horn with the Sydney Symphony Orchestra, and Brian Daly, a freelance French horn player based in Dublin. The final piece of the concert will be Dvorak’s Symphony No. 8. As a special offer, patrons who buy a last-minute ticket to the concert will receive a complimentary pass to the DSO Supper Club. Complimentary Supper Club Pass: Call Simone de Haan on 8946 6488, or email simone.dehaan@cdu.edu.au, with your ticket number.